To operate de facto impossible to measure ability of different kinds of tattoo to serve an emotional connector between actors I propose to use a term of symbolical capacity. The term similarly to symbolic capital but of a non-human object will help to indicate the level of emotional involvement the object may provide and make it possible to a certain extent to compare tattoo practices. For this comparison we might need to fall back upon the examples of paired tattoo and homemade tattoo. 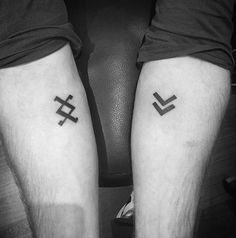 First, paired tattoo provides following levels of symbolic involvement of the participants: the tattoo is shared between the participants, which creates a shared identity feeling; the tattoos are in most cases made by participants together, which can be seen as simultaneous initiation procedure passing. In the case of homemade tattoo participants pass through slightly greater number of levels of connection: the process has to begin with the establishment of mutual benefit admittance, that can be also described as trust; the physical side of the process becomes symbolic in terms of own intimacy; the tattoo symbol itself maintains the connection as a reminder not only of the first order (e.g. heart reminds about love) but as one of the second order referring to the process of tattooing that took place in past; homemade tattooing also possesses identity- shaping power, the role-changing itself becomes an identity from the time of the performance (e.g. referring as “one who tattooed (me)” or “one whom (I) tattooed”). Considering this brief analysis, it might be concluded that on micro level homemade tattoos have greater symbolic capacity than formal parlour ones.